Some people envision rabbits as these quintessentially quiet animals who sit silently and never make their feelings known. However, in the real world, rabbits are actually quite vocal and will let you know precisely how they feel about any given topic. Of course, as with people, some rabbits are more vocal than others are. A few rabbits actually are quite docile and you must coax their feelings from them, but they’re rare (as are quiet people). Females who are annoyed with the male in their cage really do growl quite loud and will sometimes charge the male. In fact, several females we’ve had were quite willing to take a chunk out of the poor guy’s back (and all he was doing was asking for a date). If the female is feeling territorial, the growl may become a shorter and louder bark. When you see this behavior, it means the female is bred and the male had better just leave as quickly and as quietly as possible. If you hear barking from two males, it means that they’re both alpha males and are about ready to get into a fight. You must move one of the two males to a different cage. A change in cage can sometimes trigger an annoyance response. We moved one of our rabbits to a different (and we thought nicer) cage. The rabbit was obviously not impressed. She spent quite some time charging at us, thumping her feet, and growling quite loudly. In some cases, she preceded a lunge with a hiss, which showed a kind of extreme annoyance. Yes, we heard her loud and clear (unfortunately, there was little we could do to appease her and she finally decided the new cage would be just fine after all). Sometimes thumping goes hand-in-hand with some sort of physical demonstration. One male seemed quite annoyed that another rabbit (a female and her kits) had received all the nice carrot shavings while he was offered the same dry rabbit pellets as normal. So he thumped quite loudly and then threw his dish across the cage. We decided that the extra carrot in the refrigerator would make a wonderful peace offering and the rabbit agreed. The chickens ate the food that fell through the bottom of his cage, so everyone seemed quite happy with the way things turned out. Honking is another vocalization. Think of it as someone with a serious sinus condition and you get the idea. A rabbit will generally make this noise when happy or wanting attention. Some of our breeder rabbits will actually shovel their noses into us and then honk to demonstrate that we really do need to pay attention to them. Of course, if we show them some, but not enough attention, the rabbit will almost certainly thump when we close the cage (and possibly throw the food dish against the wall as well). Some rabbits will also grind their teeth when they are happy and want attention. Teeth grinding is a good thing and you want to hear it. It’s important to note that the teeth grinding in this case is quiet and light, not the heavy grinding associated with eating something. Along with honking and teeth grinding, seriously happy rabbits will sometimes coo. Depending on the kind of rabbit and the level of happiness, some people associate this sound with a sort of buzzing noise. The rabbit will usually be extremely relaxed, sometimes with its back legs splayed out, and normally with its eyes closed. Finally, there is the sound no one wants to hear, the high pitched rabbit scream. You normally hear it when the rabbit is in pain or in fear of its life. If you hear this sound, you know the rabbit needs immediate help. We heard it when some feral dogs in the area decided they might like a rabbit for dinner. Fortunately, our cages are well-built and the dogs didn’t have their way, but the rabbits in those cages were screaming quite loud. In fact, at least one of them passed out from fright (it later recovered). Facial activities can also alert you to a rabbit’s mood. For example, twitching whiskers often denote curiosity (normally for a food item, but also for attention). The faster those whiskers twitch, the more curious the rabbit. Ears held forward and at the alert tell you that the rabbit has heard an unexpected sound. We’ve noted that some rabbits will furrow their brow when upset or annoyed. What sorts of sounds does your rabbit make? Have you noticed facial expressions, positions of back feet and ears, and other behaviors that help you understand what your rabbit is trying to say? Let me know what you’ve observed at John@JohnMuellerBooks.com. We let our chickens run about as they want. Yes, they have a run so that they can stay in a safe environment when desired or they’ll have a protected place to run if something chases them, but chickens do need the freedom to wander about. Besides, letting the chickens run around doing what chickens do best, eating insects, helps reduce the tick population in the woods. So, it didn’t surprise me the other day to see chickens in our woods while I was working on a relatively large log. However, I thought that they’d maintain their distance because my chainsaw does make a frightful amount of noise. As I worked along, I noted that the chickens were getting closer. As soon as they saw me looking at them, they curtsied. Now it may sound quite odd to hear that chickens curtsey, but ours do quite regularly. The move their wings out in a manner reminiscent of a woman holding out her skirts and then they do a bit of a bow legged dip. It really is quite humorous to see. Our chickens curtsey when they want us to pick them up and hold them. Normally, this is followed by some amount of petting and us telling them how good they are. Our birds truly are spoiled in grand fashion. Since I didn’t want to stop cutting the log up, I ignored the chickens and kept working. I felt that they would probably head back the other direction due to the noise of the chainsaw. So, it surprised me quite a lot to look up and see that they had gotten closer still. When they saw me looking again, they curtsied yet again—looking quite annoyed in a chicken sort of a way. I could almost see them huff and they were quite annoyed that their human just hadn’t gotten the idea that they really needed to be picked up and told what good birds they were. Not taking the hint, I decided to continue working on the log. Certainly, they’d get the idea this time and go in the other direction or possibly stop to watch me for a while (something that chickens do relatively often because they really are quite nosy). When I looked up the third time, the chickens had gotten dangerously close to my logging operation and I decided that I really must get them to safety. Seeing me look again, they not only curtsied, but squawked quite loudly in order to better attract my attention. So, I shut my saw off and went over to the two birds. I picked a bird up in each arm (good thing there weren’t three of them). Now, I’m walking down this rather steep hill, one chicken under each arm, hoping that I don’t fall. All the while I’m telling the chickens what good birds they are. Eventually, I get to the coop and let them inside. I go inside with them and tell them what good birds they are again and give them some pets. At this point, I closed the run door, got the rest of the birds inside, and then went back to work. Lesson learned? If your chickens really think they need to be petted and they take the time to curtsey, don’t ignore them. I have to admit, they really did make my afternoon better. I laughed about their antics all the way back up the hill where I finished my log, loaded it into the cart, and dumped it down the chute. Feel free to share your favorite humorous chicken story with me at John@JohnMuellerBooks.com. It can be hard to come up with a game that isn’t boring, that everyone in the family can play, and that doesn’t take forever to play. Telestrations is a game that fulfills all of these requirements and far more. My sister has said that Telestrations has turned into one of her favorite games and I must admit that I like it quite a lot too. The basis behind Telestrations is simple communication. You get a word that you must draw on a pad that is issued to you. It actually helps if you aren’t very artistic. I don’t think the game would be quite as much fun with a group of artists as it is for those of us who are a little lacking in drawing skills. After you draw your word (not letting anyone else know what it is), you pass your pad to the next person. That person looks at what you have drawn and tries to guess the word. He/she writes the word down and passes the pad on. The third person draws the word that the second person guessed. After creating this new drawing, the third person passes it onto the fourth. The cycle continues until you get your pad back. Because each person has come up with a different interpretation of your word, the results are hysterical. You go back through the drawings and guesses to see what sort of journey your original word has taken. There is supposedly some means of keeping score and determining a winner, but we haven’t actually ever done that. The fun is in seeing what other people come up with. The results really are quite humorous at times. However, as far as I’m concerned, the best part is that everyone is talking to everyone else and everyone is having a great time. Unlike a lot of games on the market, this one is completely reusable. Except for having to replace the drawing pens at some point, once you buy the game you have everything needed to have a great time. The pads are plastic coated and work like white boards. The kit even comes with some special swatches of cloth for wiping off previous drawings. If you’re looking for a good time at a family event where the event is held in the house, you really do need to check out Telestrations. Generally, we get the chickens into the coop at the end of the day before the sun sets to ensure that they’re safe during the evening hours. Many predators lurk in the darkness and I don’t know of many predators who will turn down a good chicken dinner. So each day, near sunset, we call to the birds and close up the coop. Everyone is safe for the evening because the coop really does lock up nicely and keeps out the predators. We had guests over this last Saturday and time got away from us because everyone was laughing so hard while playing a game named Telestrations. We’ve played the game a number of times now and it has never lost its appeal. In the meantime, the sun had set and I saw that we were now in the subtle glow of twilight. So, I quickly rushed to the chicken coop to get our chickens up for the night. Fortunately, the chickens had already come in for the night and were resting on top of the nest box. That is, all of the chickens were there except one—a beautiful buff orpington that has a tendency to fly out of the run to peck at the grass on the other side of the fence. I counted the chickens several times and decided that I really must find this chicken before it got much darker. After hunting around the run and not finding her, I started calling to her in the woods. She wasn’t anywhere to be found. The first thought that came to mind was that a predator had a chicken dinner on us. Even so, I continued to look. By now it was dark. So, I went into the house and got out my flashlight. I decided to look once again inside the coop. The chickens were still roosting comfortably next to each other and were quite annoyed at me for disturbing their sleep with that obnoxious flashlight. A count showed one chicken still missing. However, that was when I noted a hump in the row of chickens. On a hunch, I moved the chickens aside (one of whom pecked my hand for my efforts). There under the rest of the chickens was missing buff orpington—quite warm from being under cover of the remaining chickens. At that point, I laughed to myself and closed up the coop. The chickens went back to sleep and all was well with the world. The next time I’ll be sure to move the chickens around a little to ensure I’m not missing anyone who has hidden from view. Let me know about your interesting chicken stories at John@JohnMuellerBooks.com. Every one of the animals has something funny they do. They don’t do it every day—the trick would cease to be funny if they did. The various activities change with time, so nothing ever gets really dull. 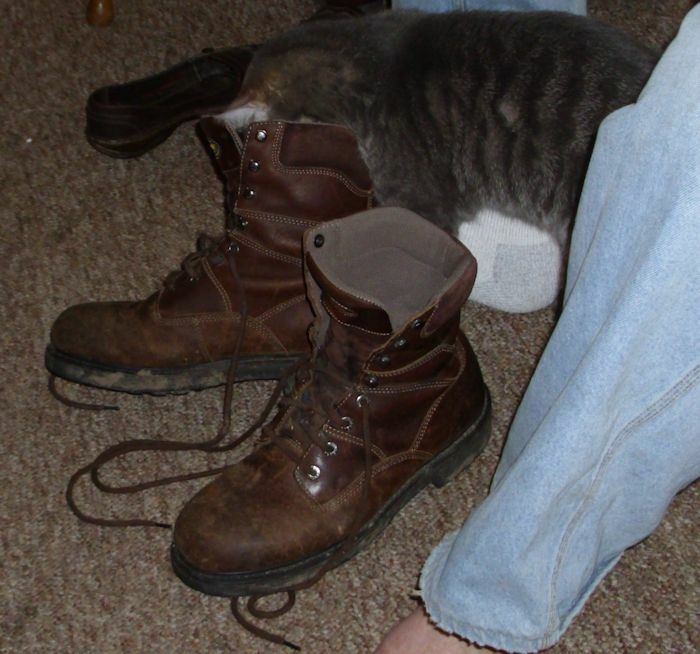 Smucker has decided that dad’s boots smell extra good. I can’t sit down to put my boots on before work without him sticking his head and sometimes most of his body into my boots. Even when I finally get the boots on (and believe me, sometimes it’s a real chore), he absolutely has to play with the shoe laces. Just why my boots are so fascinating is known only to Smucker. 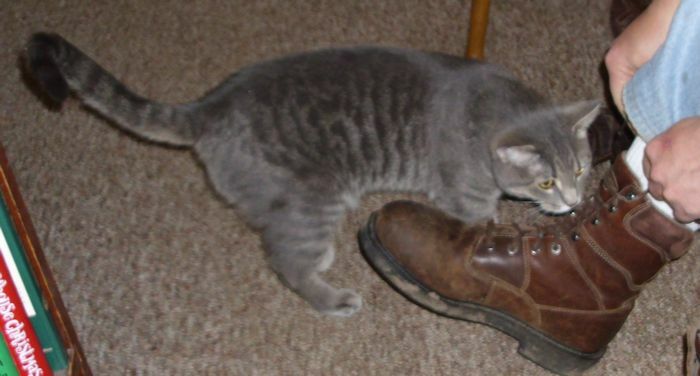 He’ll eventually tire of my boots though (at least, I hope he does) and move onto something else. In the meantime, I’ll continue taking the play mice and glitter balls out of my boots before I put them on and then wrest control of them from the cat. Meanwhile, Sugar Plum has decided that she needs constant reassurance. If I so much as move at night, she’s right there wanting to be petted. Explaining that it’s the middle of the night and I really need my sleep doesn’t apparently carry much weight with her. After a scritch or two, she lays back down by Rebecca’s side. Bubba is currently in a battle with Reese over her bed. The bed is in my office, by the way, so I get to witness each battle (I haven’t decided whether they’re mock battles or a bit serious). 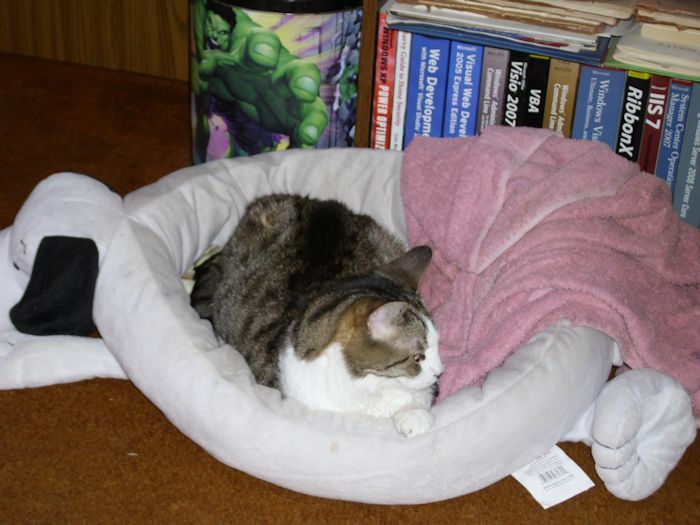 I sometimes find both Reese and Bubba packed into the little bed and wonder just how it is that they fit. Today though, Bubba won the bed. Someone tried to convince me once that they had just a plain old dog. So far I haven’t met any plain animals. All of our kids have been special in some way—each has had a unique personality. Take time to let your kids be themselves sometime and you might be amazed that your dog isn’t old, plain, or just anything else at all. What special traits do your kids have? Let me know at John@JohnMuellerBooks.com. As one woman at the local coffee shop stated, “It’s Wisconsin, what do you expect?” I guess that sums things up nicely. 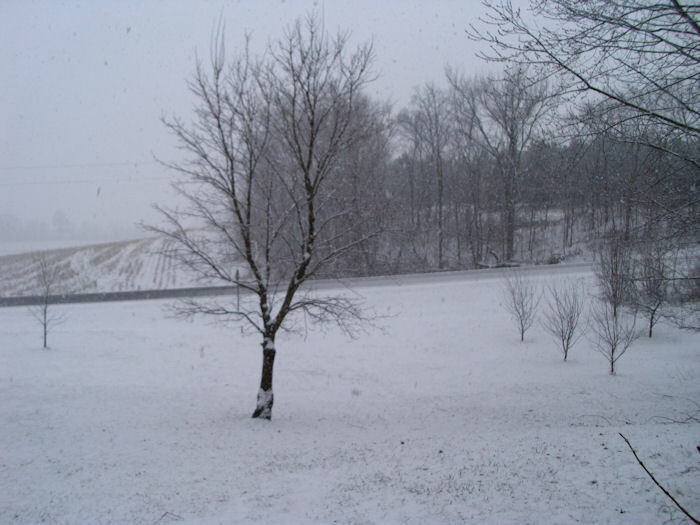 Whether you’re knee deep in snow or enjoying spring flowers, have a great day .